Beginning in the mid 1800’s, two Railroad Lines brought Philadelphia and Camden vacationers to Lakeside Park in Kirkwood. City dwellers, realized the enjoyment of suburban living with convenient transportation to work and soon, the surrounding land became valuable. Most farmlands were sold off to developers. In 1888, such developers were Charles King, Harry Smith and additional businessmen from Camden, who formed The Rural Land Development Co. On March 23, 1889, the R.L.D.C. purchased a roughly, triangular piece of farmland from Mr. John Kaighn and Mr. H. Lippincott (Hinchman Farm) and subdivided the area into 603 lots. It was King who named the proposed town, Stratford. As transportation to industrial and business establishments improved, the potential population of Stratford and surrounding communities grew. It soon became evident that there would be a need for a local place of worship. Mr. Harry Smith was a devout Methodist Episcopal and Class Leader for the local Methodist Society, that met in his home at 107 S. Atlantic Ave. (The house still stands.) There being only two or three homes in the small village of Stratford, members came from surrounding towns. 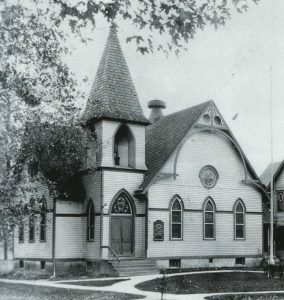 As membership to the Society increased, meetings moved to Stratford’s private schoolhouse. It was a converted sheep barn that had been moved from the Lippincott farm to Union and Kirkwood Avenues. In 1892, plans for a house of worship were set in place. Pledges to build a church building in Stratford are collected. On May 26, 1892, church records list the first amounts pledged to build a church: John Zimmerman – $100.00, Selden Twitchell – $100.00, Chas. S. King (by subscription) – $100.00 and H.G. Smith – $50.00. Mr. King, who was a part owner of the R.L.D.C., wasn’t a member of the Society but, as a businessman, knew the faster a church was built, the faster the lots would be sold. John Zimmerman was authorized to collect money, “to be applied in the erection of the Stratford M. E. Church.” By this time, only 5 or 6 homes had been built on the large tract of 603 lots. The first choice for erecting Stratford’s first church building was the N.E. corner of Laurel and Grand Aves. “on account of persons coming from Laurel Springs and Laurel Mills.” (H.G. Smith.) It was later changed to the S.W. corner of Union and Central Avenues. There was no question that, the first house of worship in town would be The Stratford Methodist Episcopal Church. As plans for building the church were set in motion, meetings continued to be held in the converted sheep barn. “We did not have stuffed Opera chairs, the seats consisted boards placed across the ends of nail kegs and some set on the raised platform of 6” to 8” and left their feet hanging down.” “We had to carry oil lamps from our homes to light up the room.” (H.G. Smith.) Preachers were supplied from local churches. Ground for the new church building was broken in September, 1892 and the basement wall was finished by October 10th, 1892.The Corner Stone was laid on Thursday, February16, 1893. The Stratford Methodist Episcopal Church was dedicated on July 9, 1893, less than a year after the ground breaking. The total cost of the Stratford United Methodist Church’s original building, at Union and Central Avenues, is listed as $4307.68.